She is the winner not only the Women Grand Prix in Jermuk but overall Grand Prix cycle. The Jermuk Women Grand Prix has entered the annals of history with a thrilling final round in which nearly all games were decisive. The ladies demonstrated uncompromising fighting spirit and stamina, in an excellent display of competitiveness and sportsmanship. Dear Elina, it is great to see you once again in Armenia, in the comfort of Jermuk. How do you feel the atmosphere of Jermuk affects the quality of your chess? It is always a pleasure to play in one’s homeland, but at the same time a greater feeling of responsibility. In Jermuk, while the nature is beautiful and the air is so crisp, it nevertheless takes me a few days to acclimate. To play chess at an altitude of 2000 meters is not so easy. 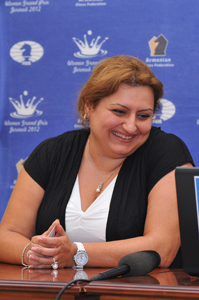 Dear Nadezhda, this is not your first time in Armenia; we had the pleasure of seeing you in Jermuk in 2010. Please share with us your impressions of Jermuk and comment if you will how you feel here. Two years ago I was in Jermuk with my sister, and without a second though I’d visit again. I feel wonderful here, considering the climate, the natural beauty, the fresh mountainous air, all of which make me feel good. 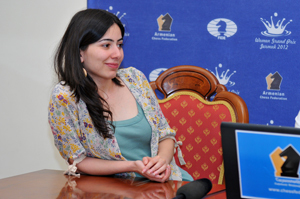 As the participants approach the finish line at the Jermuk installment of the FIDE Women Grand Prix, the tension continues to rise. 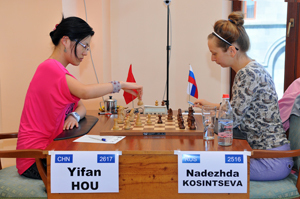 With the penultimate round already complete, the reigning World Champion Hou Yifan solidified her grasp on first place, and with it, first place in the entire Grand Prix cycle. Dear Lilit, once again you find yourself playing chess in the city of Jermuk. It seems that being in Jermuk positively affects the quality of your play, as for example your impressive result in 2010. What is the secret of Jermuk? Beautiful nature, fresh air, and a pleasant atmosphere all combine to result in conditions which encourage good chess. Let’s wait and see what happens this time around. 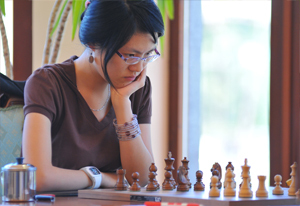 The final rounds are upon us in the Jermuk Women’s Grand Prix tournament as the 9th out of 11 rounds has concluded. 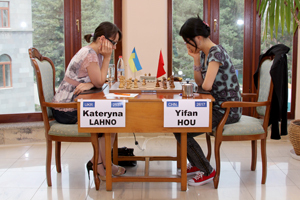 World Champion Hou Yifan has made a strong run in the last few rounds, and has surpassed her fellow Chinese rival Ju Wenjun who had been leading from the start. Meanwhile, Wenjun earned a men’s GM norm, while Ruan Lufei, with a nice tactical win, secured a men’s IM norm. Congratulations to all of the deserving chess players! Dear Humpy Koneru, how do you feel in Armenia? How do you like the city of Jermuk? This is my first visit to this country. I like the beautiful mountains of Jermuk and the atmosphere is very pleasant.